Prev Classic Victorian Clawfoot Tub. Next Periodic Table of Condiments that Go Bad! 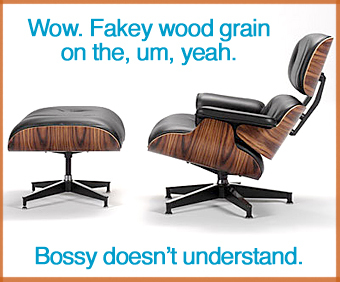 Eames® Lounge Chair & Ottoman. Available here online at Smart Furniture. $3599 – $4499. And take out a second mortgage to buy the ugly sucker? Oh, Bossy, I don’t either. Not at all. As a once-upon-a-time design student, saying anything against the Eames’s or their chair was verboten. I love the curves.